A team of government and outside experts gave suggestions on preventing wildfires but failed to take positions on possible solutions and left lawmakers to decide how to proceed. Laura Sambol reports. Gov. Gavin Newsom said Friday that lawmakers should consider changing California's strict law that makes utilities pay for wildfire damage caused by their equipment, regardless of fault, a controversial proposal that has failed to gain traction in the past. "We're in real trouble right now as it relates to these utilities being vulnerable to bankruptcy and liquidation," Newsom said, though he declined to take a firm position on whether the law should be changed. Instead, he challenged lawmakers to put wildfire-related bills on his desk within 90 days. His comments came as he released a 58-page report from a "strike team" of government and outside experts that outlined California's stark reality as wildfires worsen. Pacific Gas & Electric Corp., the nation's largest utility, filed for bankruptcy in January and California's two other investor-owned utilities, Southern California Edison and San Diego Gas & Electric, recently had their credit ratings downgraded, which could make it harder to access capital and pay for equipment upgrades. Newsom and lawmakers are looking for a way to keep the utilities financially stable without leaving wildfire victims and customers on the hook for billions of dollars in damages from recent deadly wildfires, but mindful that the solution not be seen as a bailout for PG&E, which has often been slow to address its problems. Lawmakers have repeatedly debated the liability standard, including as recently as last year, when they ultimately abandoned the idea in favor of a process that makes it easier for utilities to pass on some costs to customers. The state law that holds utilities entirely liable for wildfires caused by their equipment allows insurance companies and uninsured wildfire victims to sue utilities for damages, so any changes to the law would face strong pushback from those groups and attorneys who represent them. But Newsom argued that keeping the utilities stable is good for everyone. "Everybody wants someone else to pay for it," Newsom said. "We all have a burden and responsibility to assume the cost." 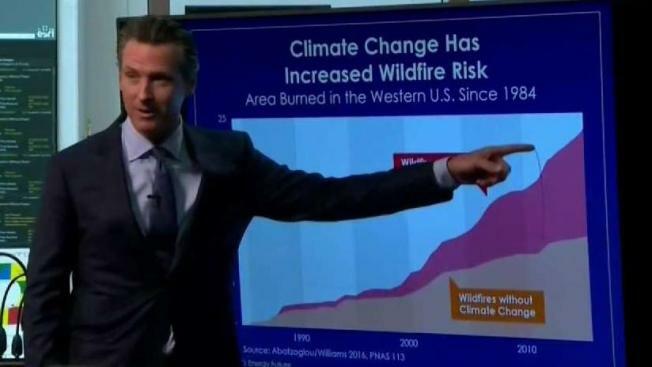 Newsom's report also suggested creating a fund that utilities could tap in the short term to cover wildfire costs or creating a wildfire compensation fund that utilities and ratepayers would pay into that could be used after particularly devastating wildfires. Republican Assemblyman Chad Mayes has already authored legislation to create a catastrophic wildfire fund. Senate President Pro Tem Toni Atkins called Newsom's report "thorough, substantive and well-researched" and noted that lawmakers already debated some of his ideas last year. Democratic Sen. Ben Hueso, chairman of the Senate's energy and utilities committee, said the utilities' financial trouble requires "urgent, and potentially some unpopular, actions." Credit rating agency Moody's said some elements of the report could help utilities' credit, but its full effect won't be known until the Legislature acts. Two of California's deadliest and most destructive wildfire seasons hit in 2017 and 2018, with 85 killed in a single Northern California wildfire last November. Insurance losses for that fire topped $8 billion. Officials haven't determined a cause, but PG&E has acknowledged its equipment likely sparked the blaze. Newsom had harsh words for the utility Friday, saying he'd keep every option open, including a takeover of the utility or a move to split it into smaller entities. He called on the utility to "no longer misdirect, manipulate, mislead the people of this state." The report said any changes in utility liability rules should give incentives to utilities to invest in safety and, critically, impose penalties for failing to do so. It said any changes also must continue to hold shareholders rather than customers, responsible for safety failures and suggested adjusting how much profit utilities and their executives can make based on their wildfire safety performance. The report also recommended discouraging new development in high-risk fire areas, where California's housing crisis has pushed residents seeking affordable housing into once-rural areas. The report urged the state to encourage building in urban and low-risk areas for those who would otherwise be shut out. Newsom's "strike team" included representatives from state agencies including the Public Utilities Commission, Department of Insurance, Office of Emergency Services and the California Department of Forestry and Fire Protection. Newsom has hired the high-powered law and investment firms O'Melveny and Myers and Guggenheim Securities to provide expertise at a cost of more than $6 million over six months, according to contracts obtained through the California Public Records Act.